This SEMA 2011 Ford Raptor SVT SuperCrew has got to be the ultimate rally bush-bashing machine around? It’s a special project put together by Addictive Desert Designs and JPM Coachworks – as well as Hennessey Performance for the 600-plus horsepower engine – and it’s set to be unveiled at the 2011 SEMA Show in November. 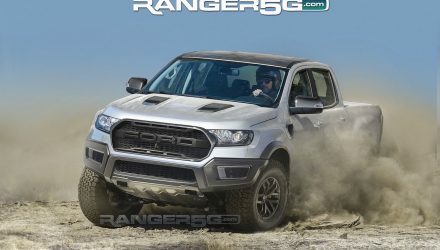 It doesn’t look like the friendliest of vehicles, this special SEMA 2011 Raptor SVT SuperCrew, but then, that’s exactly the theme Addictive Desert Designs and JPM Coachworks were going for. It’s all in black and features a big imposing front underskin protection plate and nudge bar, with significantly raised suspension, and a custom roll bar in the rear tray as well as huge aggressive mud tyres. The 2011 Raptor SVT SuperCrew comes from the factory already featuring a performance desert-racer theme. Addictive Desert Designs and JPM Coachworks have completely modified the vehicle though, inside and out, so the theme is amplified drastically. Under the bonnet, Addictive Desert Designs and JPM Coachworks left the modifications to renowned tuner Hennessey Performance, where they fitted a VelociRaptor 600 SC kit consisting of supercharging the original 6.2-litre V8 engine, so it now develops 451kW of power, or 605hp. The engine gets a centrifugal under-bonnet supercharger and intercooler system. 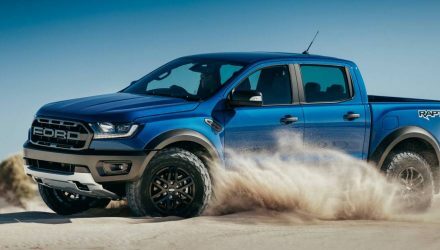 Hennessey says the unit is powerful enough to propel the big ute from 0-100km/h in 5.2 seconds, and onto a quarter-mile time of just 13.6 seconds. Inside, the special SEMA 2011 Raptor SVT SuperCrew is kitted out in a full interior overhaul by JPM Coachworks. The company equipped the Raptor SVT with high-quality trimmings and upholstery, using materials such as Alcantara and Royal Hides from Edelman Leather. 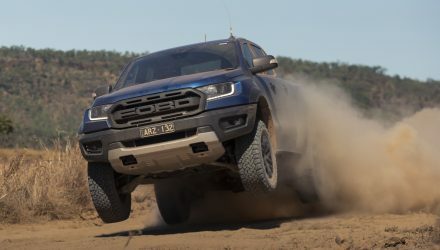 As for the exterior, the SEMA 2011 Ford Raptor SVT SuperCrew was sent to Addictive Desert Designs where it received new ‘Stealth’ front and rear bumper bars, various protection plates and rock guards, and some LED lighting. 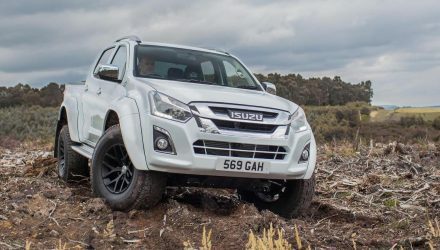 The company also fitted some King Shocks coilovers front and back providing 355mm of travel, 15-inch disc brakes by Baer Brakes and a set of Fuel Hostage wheels wrapped in meaty Goodyear MTR Kevlar tyres. All of the underside is also coated in Line-X protective coating, while a big dual exhaust system by Spintech Muffler makes sure everyone can hear it coming. The special SEMA 2011 Ford Raptor SVT SuperCrew by Addictive Desert Designs and JPM Coachworks will be on show at the 2011 SEMA event which runs from November 1 to November 5 in Las Vegas, USA. How much would you love to take this thing for a rip through a paddock? Someone else’s paddock, obviously.